Jewelry by Rhonda - Merchant Policy Page - Please Read - Very Important! If you want to know whether or not your order can be rushed to you, how much it would cost to rush it out, and an estimated delivery date...contact us. VERY IMPORTANT! Be sure to key in your correct BILLING address (this is the address the credit card provider currently has on-file for you) for the credit card you are using (shipping address can be different). If the address does not verify, it will take longer for your order to ship (sometimes up to a week delay). Please note: Make your check payable to A T Enterprises and note on the memo line what the check is for (ex: Jewelry by Rhonda Order# 1000). Please note: Unless you are a repeat customer, items will not ship until personal checks have "cleared" the bank (this takes 7-10 days). All checks must be written in US Funds and made payable to A T Enterprises. Returned Check Fee: $25 plus any additional fees the bank charges. Checks, Money Orders and Bank/Cashier's Checks must be in US funds. If you place an order, your name and e-mail address are captured. 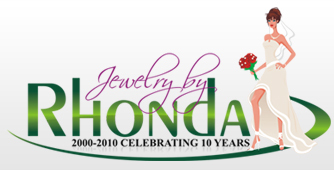 Jewelry by Rhonda will never sell, rent or pass along your personal information to any other third parties under any circumstances. We respect your privacy and desire not to be "spammed". See the information we have posted on the Can Spam Act of 2003 listed below. I hate junk emails in my inbox every day, so I take this very seriously. I will contact you via e-mail in most cases. If we are working on a special order (such as wedding jewelry, cufflinks, etc. ), it may be necessary for me to contact you by telephone. Your personal information is not stored with Jewelry by Rhonda, so you will enter it into a secure processing system with each order placed. This includes credit card information and shipping address. President Bush signed into law the Can Spam Act of 2003 (Public Law No. 108-187). This new law, effective January 1, 2004, is intended to cut down on the rising level of unsolicited commercial email. To do so, it imposes certain requirements for the delivery of commercial email and institutes certain penalties for failing to comply with such requirements. In-Stock Items...Orders usually ship within 1-2 business days from the order date. If there is a reason for shipment delays (such as vacation, holiday, etc. ), it will be posted on our Home Page and our News Page. Out-of-Stock Items...Charms are re-stocked each week. Feel free to email me if there is something you want to order and it is out-of-stock. Hand-Crafted Jewelry and Cufflinks...These orders ship as soon as possible. Please allow 1-3 weeks for your jewelry to be handcrafted and shipped. For wedding party orders, I will give you an estimated delivery date when your order is finalized. Effective December 2000, the Federal Trade Commission (FTC) issued guidelines for businesses that sell jewelry. These guidelines deal with accurate descriptions of jewelry products. It is up to us, the sellers, to "truthfully and non-deceptively" describe our products to you, the consumers. Click Here for more information. Jewelry by Rhonda sells genuine cultured freshwater pearls. Our pearl jewelry comes with a pearl information card. Dyeing - to achieve a desirable tint, hue or color. Jewelry by Rhonda sells sterling silver jewelry and uses sterling silver components in all of our handcrafted jewelry items. Most charms and other jewelry pieces have the .925 hallmark somewhere and is usually visible with the naked eye. Sometimes this hallmark can only be seen under a microscope. Sometimes the part is so small that there is no room for the hallmark. It is never our intention to use plated or imitation silver that is represented as sterling silver. We depend on reputable suppliers and manufacturers to accurately describe items as sterling silver when we purchase from them. We try extremely hard to resource trustworthy vendors to purchase from. We use domestic vendors as much as possible but some of our items can only be found outside of the USA and have to be imported. We also randomly test our sterling silver for authenticity with the patented precious metal tester pen. We want you to be pleased with your purchase. We offer 30 day returns on items returned in new condition other than special order items such as Cake Toppers and Wedding Bands that are made to order. We try to describe all items as accurately as possible - we would never intentionally mislead you about a piece. Please pay careful attention to the description, size specifics and picture of an item. Email us with any questions BEFORE you buy. Monogram Wedding Cake Toppers are non-refundable and non-returnable. Each one is specific to your initials and is usually a one-time use item. The monogram order is not placed with the manufacturer until you place your order - each one is a special order. This policy is non-negotiable. Email us with any questions BEFORE you buy. Wedding Bands are non-refundable and non-returnable. Each one is specific to your request (size, engraving, etc.) The ring order is not placed with the manufacturer until you place your order - each one is a special order. This policy is non-negotiable. Email us with any questions BEFORE you buy.